On Thursday, Minnesota Sands took an appeal of Winona County frac sand ban to state supreme court, the Winona Daily News reports. The Land Stewardship Project responded with a statement about the action. In a July statement, Minnesota Sands said a dissenting opinion from Judge Matthew Johnson recognizes its concerns about the discriminatory nature of the ban. Johnson wrote that the court should look at the “realities of the marketplace” when evaluating the ban. Because Minnesota doesn’t have significant oil and gas reserves, there is no in-state fracking. Read the entire story at the Winona Daily News, which has published the most extensive story on the appeal. On Aug. 30, frac sand corporation Minnesota Sands filed a petition with the Minnesota Supreme Court in a continued attempt to subvert local democracy and undo the frac sand ban in southeastern Minnesota's Winona County. The ordinance was passed by Winona County Commissioners listening to the will of the people, and has already been upheld in District Court and at the Minnesota Court of Appeals. This last-minute, desperate attack on the ban is further proof that wealthy corporate interests are deeply threatened by the power of organized people working together through our local governments to protect the common good for people and the land. Minnesota Sands has refused to disclose the identities of its owners and financial backers. The source of the money being paid to Faegre Baker Daniels, Minnesota’s largest law firm, to continue to unreasonably drag out this legal case, is unknown. We are confident that, in the unlikely event the Supreme Court even chooses to hear this petition, the ban will once again be upheld. The right of local governments to protect their communities from harmful, extractive corporate activities, such as frac sand operations, is very clear. Photo: Yard signs supporting passage of the ordinance graced lawns of citizens throughout Winona County. It's worth realizing that Southeastern Minnesota wasn't the first place Minnesota citizens pushed back on silica sand mining. Why it matters: The Kasota Prairie is a testament to residents taking a stand to protect and preserve natural resources and shows the need for ongoing diligence. In 1979, it seemed a fight impossible to win. A rag-tag group of local residents formed Save the Kasota Prairie to do battle with mining giant Unimin, hoping to slow mining of silica sand and protect the prairie between Mankato and St. Peter. At the time, even the idea of reclaiming spent mines was just getting off the ground. While the state had passed the Mineland Reclamation Act in 1969 it wasn’t until the ‘80s that it was being amended to give it more teeth. SKP faced bruising defeats as it took legal action against the well-financed company, losing their case in lower courts. But while the activists were losing the battles they were winning on a more important front — raising public awareness through years of public events, fundraisers and education efforts. And they made the prairie issue an important one in local elections. More and more area residents came to understand that the dwindling natural areas around them couldn’t be protected without people becoming involved. In the end, SKP scored a long-lasting victory. They didn’t stop the mining, but after SKP filed suit in the Minnesota Supreme Court Unimin proposed a compromise agreement. That settlement led to restoration of about 300 acres of prairie that was planted in native grasses and flowers. The land borders a state-owned nature preserve and the two parcels offer people a chance to see a beautiful landscape that looks like the rolling prairies that covered much of south central Minnesota in the mid 1800s. Today, those who fought for the prairie are working to get more people to experience it and are holding an open house from 8 a.m. to noon Sept. 15 at the entrance to the prairie on 468th Street. . . .
Read the rest at the Free Press. The pre-Unimin Kasota Prairie holds a dear place in our heart, as it was the first place we saw pasque flowers in spring, and the rocky "prairie"--an extensive rock terrace 70 feet above the Minnesota River Valley, but below the bluff line--was our introduction to bluestem as well, the characteristic native grass of the tall grass prairie. Nearly all of it has disappeared from Minnesota, but some still flourishes here on the Lake Traverse Reservation on the Coteau in South Dakota--enough to see that places like the Kasota Prairie are worth the fight. Decades ago, such a firm partnership would’ve been hard to imagine. Save the Kasota Prairie, or SKP, was formed by environmentalists in 1979 to challenge Unimin’s plans to mine the land. The group insisted an environmental impact statement be completed if the company wanted to mine further. They collected signatures, campaigned for and won local elections in Kasota and mounted spirited court appeals to halt any progress. Defeats in lower courts didn't stop them. They appealed to the Minnesota Supreme Court, which prompted a compromise between the sides. Their 1984 agreement resulted in the preserved prairie ecosystem in existence today. . . .
Bob Huffman of Princeton, Minnesota-based Prairie Restorations, an ecological restoration company, was the prairie's land manager for years starting in 1998. He said managing prairies means stemming invasive plants like sweetclover and buckthorn in favor of bluestems big and little, prairie dropseeds and other native plant species. Controlled burns were and still are a common land management tool, Huffman said. Photo: Save the Kasota Prairie. On Thursday, we posted Fillmore County citizens' victory: Newburg Twp adopts moratorium on large scale feedlots. The Newburg Township board voted 2-1 on Thursday to adopt a one-year moratorium on the construction of feedlots with more than 500 animal units and new non-farm dwellings. The moratorium will directly affect the 4,980-head swine facility proposed by Catalpa LLC, 10 miles east of Harmony. At the proposed site, an estimated 7.3 million gallons of liquid manure would be produced annually, stored and spread on approved farms in the area. There has been pushback from members of the community who believe the proposed facility has a potential hazardous risk for air, water and land pollution. Especially in the area’s karst geology, some say there is a higher potential for groundwater contamination. They have asked the Minnesota Pollution Control Agency to require an Environmental Impact Statement for the facility, which would provide in-depth research into any risks. The MPCA has not yet made a decision. Loni Kemp, one of the leaders of the citizens group Responsible Ag in Karst Country, said the moratorium was a decision and course of action well within their rights as a township. “This is allowed by Minnesota law, so that cities and townships can take some time off to either change or create a zoning ordinance to meet their needs,” Kemp said. “This is a right that local governments have, because the Legislature decided long ago that you can’t expect small communities to be completely up to speed for everything; They need time to consider what their regulatory needs are.” . . . The fight over a proposed hog farm in Fillmore County is over for now. It started with the proposal for the farm by Catalpa LLC in Newburg Township. It would host enough animals to require a lagoon that would hold 8.9 million gallons of manure. Community members had their chance to speak their minds to the township council Thursday night. The farm would be built what's called Karst landscape. Karst is made up of porous limestone that creates sinkholes and disappearing springs. This type of geology can allow surface pollution to enter the groundwater in a matter of hours. Back in July, neighbors of the proposed farm Mabel were bused up to the state capitol, to ask the Minnesota Pollution Control Agency to start an Environmental Impact Statement or "EIS." An EIS is an in-depth review of how a potential project may harm the environment. Most township residents against the farm proposal believe the farm's existence would be detrimental to the environment. "Nobody wants their water contaminated, the air, property values, roads. Roads are gonna get destroyed. There's just a lot of problems that come with this and none of that has been addressed," said Newburg Township farmer Mark Spande. Although the moratorium passed, farm project runner Al Hein continues to feel confident that his project will succeed. "I'm very positive about it because I believe that when I bring the message out to other people they'll come around and understand when they have all the facts at their disposal," said Hein. . . . The Bluff Country Newspaper Group discovered "Ronald Vitter” lied about his identity and the newspaper published its apology on Aug. 16, for having been fooled into publishing the misleading letter to the editor. The Bluff Country Newspaper Group also thanked citizens who helped uncover the lie. Unfortunately, this conduct by a Catalpa, LLC, supporter is unsurprising since "Ronald Vitter" had previously sent a Responsible Agriculture in Karst Country (RAKC) member messages containing falsehoods and a thinly veiled threat. Why do you suppose “Ronald Vitter” hid behind a false name? This behavior by “Ronald Vitter” is unethical and unacceptable. Thank you to the Bluff Country Newspaper Group for investigating this person’s lie and for your transparency! We'll continue to cover the project and pushback. On Tuesday, public pressure and anticipated costs prompted Pine Island, Minnesota, to unanimously rescind a resolution of support for an ICE detention center that it approved in June, the Rochester Post Bulletin reported in Pine Island gives ICE facility cold shoulder. The Pine Island City Council on Tuesday backed away from their earlier support for being considered as a potential site for an ICE detention center. The reversal came after widespread public outcry following a council resolution passed in June. That resolution said the city would like to be considered as a potential site for a Immigration and Customs Enforcement facility run by Management & Training Corp. . . . The Appleton Prison has been proposed as one of several possible sites in Minnesota for an ICE detention center. Come hear about efforts to stop ICE and learn how you can get involved. We need all of us to rise up against this! Last week a group of 100 people showed up to the Pine Island City Council meeting asking them to rescind their previous resolution that had opened the door for a new detention center in Pine Island. Due to this pressure, good press, letters to the Mayor of Pine Island), door knocking and strong local leadership they were successful not only in getting the city council to rescind the proposal but also to apply pressure to make the city of Pine Island more welcoming to immigrants. This win in Pine Island may mean that the proposal at Appleton gets more consideration. This is a good time to take action. Let's gather on Tuesday, August 28th from 6:30 to 8:00 pm at the Prairie Renaissance Cultural Alliance, 630 Atlantic Avenue in Morris. The Prairie Correctional Facility in Appleton--owned by CoreCivic (the human traffickers formerly known as Corrections Corporation of America) has been the subject of legislation to lease or buy the private prison under the so-called Appleton Option, a move opposed by criminal justice reformers, the correctional officers' union and the Dayton administration. The Swift County Monitor reported about the possibility of ICE housing unauthorized workers at the shuttered prison in the May 25 article Illegal immigration arrests open possibilties for PC. Unlike Pine Island, the City of Appleton has been asking for this, Bluestem Prairie reported in August 2017 that Appleton MN wants you to sign petition asking Trump to lock up criminal aliens at private prison. The organizers who want to stop ICE from sending detainees to town have their work cut out for them. Photo: The Appleton prison. For a more recent photo, visit PCR's front door, via Stop Appleton MN ICE Detention Center!. Bluestem's been following the efforts of Fillmore County citizens to make sure a huge swine farrowing facility proposed in southeastern Minnesota's karst country won't prompt an environmental disaster. While demanding that Catalpa Ag LLC undergo an Environmental Impact Statement (EIS), those concerned about the project have also sought to use local zoning control on the township level to protect their water and their way of life. This is a victory for local self-governance, as one of the project shareholders went to court to deter the township, as we reported in All citizens are equal, but one thinks he's more equal: massive hog farm shareholder seeks to prevent August 2 Newburg Township meeting. The meeting was held, as we reported in Packed house at Newburg Township on using local control to protect community, karst but a vote on the moratorium was delayed until tonight. Learn more in Fillmore County citizens stand up as Newburg Township meets on CAFO moratorium Thursday. As Fillmore County citizens continue their efforts to protect their water, karst landscape and way of life, the Newburg Township board will hold a public meeting to consider and vote on a moratorium on the construction of large animal confinement operations. In a year in which gubernatorial candidates babble on about making state agencies serve the people, it's fascinating watching local people stand up for self-governance and local control. The Fillmore County Record's county government reporting notes that "Newburg Township is holding a public hearing at 6 p.m. at the Mabel Community Center concerning the proposed Catalpa, LLC hog farrowing facility on August 23." Some of you may have noticed the new yellow yard signs appearing around Newburg Township and Fillmore County. The yellow signs have been placed in yards and along roads in this area in support of the Newburg Township Supervisors who have a difficult situation in front of them. The township currently is debating enacting a moratorium on the construction of large animal confinement operations. To be fair, the township also is considering including in the moratorium a temporary ban on building new subdivisions. A moratorium is a temporary measure put in place like hitting the “PAUSE” button while watching a DVD. You stop the action so you can take a break and get more popcorn. In Newburg Township, the “action” is the push by Catalpa LLC to build a 5,000-hog industrial farrowing facility. The Newburg Township Supervisors are considering enacting a moratorium to pause the forward movement while considering whether an operation of this size would be good for the township or not. I support the Township Supervisors in enacting this moratorium because I think it is wise to collect all the information possible BEFORE making a decision, rather than trying to fix a problem which arises later because the decision was made without enough data. You can weigh in on this Newburg Township decision by attending the Township Meeting on August 23 at 6 at the Mabel Community Center. Come at 5 p.m. to get more information. I live two miles from the proposed Catalpa, LLC, 5,000-hog farrowing facility in Newburg Township and am concerned about the destructive effect this project will have on our community. The Minnesota Pollution Control Agency (MPCA) has for a second time postponed making a decision on ordering an environmental impact statement (EIS). The MPCA’s order of yet another test of the proposed site is proof positive that an EIS is needed and that there is significant risk of damage to our environment. The MPCA is not doing its job as it continues to delay and not call for the EIS. Over the past two months the Newburg community has seen an outpouring of support for an effort to prevent the permitting and building of massive industrial sized hog confinement facilities and other facilities like it. In May, 450 people showed their concerns at the Mabel Community Center. A record 772 comments were submitted to the MPCA expressing a wide range of concerns. Both Newburg Township and Fillmore County boards have requested the EIS. We need a full EIS because there are not only environmental effects, but also economic development, health and quality of life issues that need to be studied. Since the MPCA isn’t doing its job, local Newburg Township citizens and the Township Board are stepping up to protect our community by utilizing local control. They are holding a public hearing on Thursday, Aug. 23, that will conclude with a vote on an interim moratorium on new large industrial feedlots. This would push the pause button on new large feedlots for one year while the community decides what’s right for our area. I’ll say it again, the MPCA has not acted to protect us from a polluter. Furthermore, the local landowner, Al Hein, is suing not only our township but the officers personally. Hein is trying to block local control – democracy in its purest form. I am standing up and supporting our local township and its board. Please act to support the township. This is the best shot to stop this environmental disaster and similar proposals from harming our community. Please put 6 p.m. Aug. 23 on your calendar and join us to support our board and local control at a public hearing for an interim moratorium at the Mabel Community Center. Shame on you, "Ronald Vitter." A Catalpa LLC supporter using a false name wrote a misleading letter to the editor published last week in the Bluff Country Reader and Spring Grove Herald. The letter was an insult to locals who are rightly concerned about the impacts on our community of 5000 sows and other consequences of the proposed Catalpa LLC facility. The Bluff Country News Group discovered "Ronald Vitter” lied about his identity and the newspaper published its apology on August 16, 2018, for having been fooled into publishing the misleading letter to the editor. The Bluff Country New Group also thanked citizens who helped uncover the lie. Unfortunately, this conduct by a Catalpa LLC supporter is unsurprising since "Ronald Vitter" had previously sent a RAKC member messages containing falsehoods and a thinly veiled threat. Why do you suppose “Ronald Vitter” hid behind a false name? This behavior by “Ronald Vitter” is unethical and unacceptable. Thank you to the Bluff Country News Group for investigating this person’s lie and for your transparency! As far as current staff knows, this has never happened at any of these newspapers, at least in the past several decades. Submissions are typically honest views about local topics submitted by people who identify themselves, a requirement of most newspapers. The same process is part of the newspaper editorial process, added Phillips, as news stories on issues, government meetings and other topics carry bylines so readers know who is writing the stories. The effort for transparency also carries into advertising as efforts are made to identify who places ads, particularly political ones. The newspapers also won’t allow paid news releases disguised as stories so people know news content isn’t influenced by dollars. Since the group’s newspapers are based in small towns with a lot of personal interaction, the letter verification process became lax, noted Phillips. We posted about the Hein lawsuit in All citizens are equal, but one thinks he's more equal: massive hog farm shareholder seeks to prevent August 2 Newburgh Township meeting. The filing is embedded in the article. Photo: Yard signs popping up like mushrooms in Fillmore County. Via Responsible Ag in Karst Country - RAKC. Will new research on deer movement prompt Minnesota legislature to act on CWD? Back in March, field biologists caught and collared 109 deer. They've been tracking them ever since, trying to get a sense of where and how quickly chronic wasting disease could spread. The findings are still preliminary at this point, but so far, head researcher Christopher Jennelle said slowing the spread of the disease might be more complicated than biologists thought. "One of our female animals has traveled approximately 80 miles," he said. "That really blew our minds." Since the fall of 2016, 17 cases of chronic wasting disease have been found in the wild deer population of southeastern Minnesota. There's no cure and no vaccine, although teams of scientists are working on it. Right now, CWD is 100 percent fatal. The disease has spread rapidly in other states. In parts of Wisconsin, an estimated 40 to 50 percent of deer are infected. And that happened in a very short time. In 1999, the first year the Wisconsin DNR began monitoring the disease, just 3 animals tested positive. By 2017, that number had climbed to 600. If the same thing happens in Minnesota's deer herds, the effects could be dramatic. . . .
"What does that mean for CWD?" he said. "Well, it doesn't bode well. I'll put it that way." Another surprise, Jennelle said, is which deer are traveling. Up until this point, efforts to slow the disease tended to focus on mature bucks, which are the most likely carriers of CWD. "We totally expected our juvenile males to be our movers and shakers here," he said. But in this study, does on average traveled twice as far as bucks. So if one is infected, it could spread the disease over a much larger range. We recently noted that "Freshman girl saying smart stuff about deer hunting" won Bluffland Whitetails Association Outstanding Legislator Award for 2018. She further argued there’s no reason a legislator from the northern suburbs shouldn’t be very concerned about deer hunting and the spread of chronic wasting disease. Photo: A deer suffering from CWD. Saturday is National Honey Bee Day, and Bluestem's editor and her beau have been kept busy by our little pollinator friends, canning apples and pickling the heirloom cucumbers that require buzz pollination to bear fruit. Honey bees from the Whetstone Valley Honey hives north of Summit and Highway 12 are joined by native wild pollinators in our vegetable and flower gardens, and they're a sight to behold. Our cuke and watermelon patches have vined together, while number of volunteer muskmelon plants and a couple of acorn squashes (from over-ripe fruit we composed in the newly-turned beds last fall) have joined in the verdant riot. Because of the honey bees and their wild kindred, those vines are bearing fruit. A lot of fruit. It's an advantage of living amid agricultural land that's mostly still used for grazing by our near neighbors on the Coteau. While the Denver Post proclaims Friday as Honey Bee Day, contributing writer Betty Cahill provides a Punch List: What you should know about National Honey Bee Day that includes valuable information about honey bees and native pollinators. This Saturday, citizens from across Minnesota and the nation mark National Honey Bee Day. National Honey Bee Day was created to honor the insect responsible for the pollination of more than 1/3 of the food we eat. The day is celebrated by beekeepers, beekeeping clubs and associations, and honey bee enthusiasts from all across the country. Recognizing that Minnesota has led the nation in laws protecting pollinators, pollinator research, and is near the top in honey production, Rep. Rick Hansen (DFL-South Saint Paul) is proposing the “Lawns to Legumes” cost share program. Rep. Hansen is expected to introduce the legislation in January 2019 when the next legislative session convenes. While our legumes don't need pollinators to produce, studies suggest that the pollinators visiting our handsome heirloom bean flowers do help boost yields and our freezers' dwindling space suggests the same. We've also put in borders of native plants like coneflowers--and the bumblebees and their brethren feed there as well. Perhaps South Dakota can find its way to imitate Minnesota's policy innovations. Certainly, the beekeepers--and gardeners who convert boring lawns into habitat--would gain. As for Honey Bee Day, we'll be celebrating by doing what we do every day these days: picking cucumbers and putting up pickles. Photo: A bee in a cuke blossom. Readers draw our attention to separate items about the farm chemical glyphosate, popularly known as Round-up. Together, the stories weave a tale of a herbicide use under fire--and of its defenders. “There are levels above what we could consider safe in very popular breakfast foods,” said Alexis Temkin, the group’s toxicologist who helped with the analysis in the report. The findings by the group, which has opposed the use of pesticides that may end up in food, were reported widely. But the question of whether glyphosate is safe is not so simple. In fact, it is central to a raging international debate about the chemical that has spawned thousands of lawsuits, allegations of faulty research supporting and opposing the chemical and a vigorous defense of the herbicide from Monsanto, the company that helped develop it 40 years ago and helped turn it into the most popular weedkiller in the world. . .
Central to critiques of the glyphosate, which prevents plants from photosynthesizing, is a 2015 decision by the World Health Organization’s International Agency for Research on Cancer to declare glyphosate a probable carcinogen. That spurred a federal case in the United States over such claims and prompted California to declare it a chemical that is known to cause cancer. Read the entire piece at the Times. Here's the EWG report: Breakfast With a Dose of Roundup? Weed Killer in $289 Million Cancer Verdict Found in Oat Cereal and Granola Bars. Maggi said that glyphosate is used on around 95 percent of soy, corn and cotton harvested in the country and that there is no readily available substitute. Brazil is the world’s top exporter of soy and a major producer and exporter of corn. . . .
Monsanto, taken over earlier this year by Bayer AG , said in a statement that more than 800 reviews, including those by the U.S. environmental and health authorities, support that glyphosate does not cause cancer. The company is appealing the U.S. court ruling. . . .
Bayer AG vowed to step up its defense against a wave of U.S. lawsuits over the herbicide Roundup as it began the formal integration of Monsanto Co., acquired for $66 billion in June. The German drug and chemical giant said it will formally absorb the U.S. company after selling some crop-science businesses to competitor BASF SE to resolve regulatory concerns. Because U.S. authorities insisted that the businesses operate separately until that sale was complete, Bayer said it previously had been barred from steering Monsanto’s legal strategy. That will now change as the stakes mount in the U.S. battle over Roundup. Bayer is facing $289 million in damages after Monsanto lost the first court case stemming from claims that the weed killer causes cancer. Even if a judge overturns or reduces the award, the trial will probably be the first of many: More than 5,000 U.S. residents have joined similar suits. The move to integrate the companies came as Bayer shares continued their slide in the wake of the court ruling, falling as much as 6.6 percent on Thursday. The company has lost about 16 billion euros ($18 billion) in market value this week, since the jury’s award in the Roundup case. Bayer said it believes U.S. courts ultimately will find that glyphosate, the main ingredient in Roundup, wasn’t responsible for the cancer of the California school groundskeeper who was the plaintiff in last week’s case. It’s planning an appeal. Monsanto has insisted for decades that glyphosate is safe. The latest fall in the shares came after Monsanto failed to block California’s move to list Roundup as a known carcinogen. The state’s Supreme Court declined on Wednesday to hear the U.S. company’s arguments as to why Roundup, the world’s most widely used weed killer, doesn’t belong on the state’s list of chemicals known to cause cancer. An appeals court had rejected the company’s arguments in April. Bayer is also facing lawsuits in the U.S. over dicamba, another herbicide in Monsanto’s portfolio. The German company said it will also take an active role in any claims for damages over dicamba. Doug Goehring, North Dakota agriculture commissioner, wants the federal Environmental Protection Agency to consider a lower rate of dicamba herbicide to be applied on dicamba-beans. And if they don't, he'll likely allow lower rates in North Dakota. Complaints appear to be down in North Dakota and Minnesota, while South Dakota isn't releasing numbers. Last year there were 37 formal complaints to the North Dakota department from farmers on dicamba damage to off-target damage to non-dicamba soybeans. About 215 respondents reported problems on a less-formal online dicamba complaint survey, covering 165,000 acres. This year — with increased dicamba-bean use — there have been 44 formal complaints and the survey has only had 51 people and about 22,000 acres. Increased training for applicators and rainfall have improved the performance, Goehring says. The Minnesota Department of Agriculture online survey and complaint site is available until Sept. 15. In 2017 the MDA received 253 complaints, with damages totaling 265,000 acres. Minnesota added a July 20 application cutoff date and a prohibition against spraying at over 85 degrees Fahrenheit. As of Aug. 7, the state had received 49 complaints of alleged dicamba damage. Twenty-seven of those have requested an inspection, said Allen Sommerfeld, a department spokesman. The South Dakota Department of Agriculture is conducting an online survey but isn't offering any in-season numbers this year. . . .
We'll keep an eye as these stories drift our way. Tomorrow (Tuesday, Aug. 14) is the primary election in Minnesota. We strongly encourage supporters of Land Stewardship Action to VOTE and to make our voices heard on the important issues and decisions facing our communities and state. Also, we want to tell you about the great meetings we have had with candidates this summer, and how we have seen one candidate in particular, Rep. Erin Murphy, show the type of investment in our issues and commitment to work with us that we are looking for in the next Governor. We are writing to you as the Board and staff leadership of the Land Stewardship Action Fund, which was established by the Board of the Land Stewardship Project earlier this year to be able to more powerfully engage with candidates and to advance the values and goals of LSP during an election—stewardship of the land, advancing a sustainable food and farming system, and building healthy, just and prosperous communities. To accomplish these, we believe regular people need more of a voice in the decisions that affect our lives, and so we must build a government and an economy that are people-centered, not corporate-controlled. Co-organized a 200-person event in Willmar this spring where candidates heard from and talked with rural members of Land Stewardship Project, ISAIAH, and CURE. Through these interactions, one candidate has particularly stood out: Rep. Erin Murphy. Land Stewardship Action is not endorsing a candidate, but we wanted to share why Rep. Murphy has demonstrated the kind of leadership and approach to governing that we believe is needed. This summer, Land Stewardship Action leaders held three powerful, in-depth rural meetings with Rep. Erin Murphy. Rep. Murphy asked for these two-hour meetings to happen monthly, and she followed through. The meetings were in different parts of the state (Sibley County, Fillmore County, and Carlton County). Each meeting featured a different group of 10-15 leaders from our organization – primarily farmers, but also people who run small businesses or are in other ways involved in their community. The meetings focused on what the participants experience as the real challenges and hardships facing farmers and rural communities, and on the bold solutions needed to actually address the scale and scope of the problems rural communities and small and moderate-sized farmers face everyday. Not only did Erin show up, but she connected—listening, asking in-depth questions, responding, thinking, and co-creating solutions and ways forward that we can pursue together if she is elected. We asked Congressman Tim Walz and Attorney General Lori Swanson to hold similar meetings with Land Stewardship Action leaders, but they would not meet. Also, the Republican candidates have refused to engage with Land Stewardship Action or the Our Minnesota Future groups in a conversation about the challenges facing our state and how they will govern alongside people, despite attempts to engage with them throughout 2018. 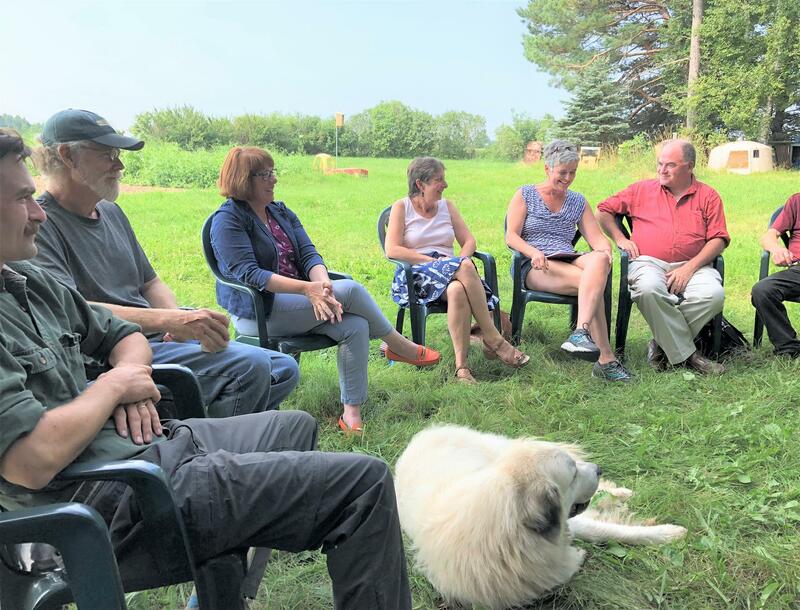 Yesterday was Land Stewardship Action’s third meeting this summer with Governor candidate Erin Murphy, at the Food Farm in Wrenshall. Murphy has followed through on her commitment to meet regularly with Land Stewardship leaders about the real challenges facing us and our communities, and the bold solutions we can achieve together. Yesterday, farmers and small-business people from Carlton and St. Louis counties talked about what they want to see a new governor do to advance small- and moderate-sized farms and local businesses—to create a shared prosperity, healthy food, and healthy land. Produce and small-scale livestock farms like Food Farm are vital to renewing the landscape, building lively rural communities, and providing a pathway for new farmers—but public resources and agencies provide little or no support. This can change! Actions that people in the meeting suggested include focusing the MN Dept. of Agriculture on supporting the vast majority of MN farms that are small or mid-sized; health care reform and support for day care; ending subsidies & tax breaks for mega-farms and investing instead in small business development and local food system infrastructure. Rep. Murphy was very supportive, asking in-depth questions and contributing ideas and approaches to take. 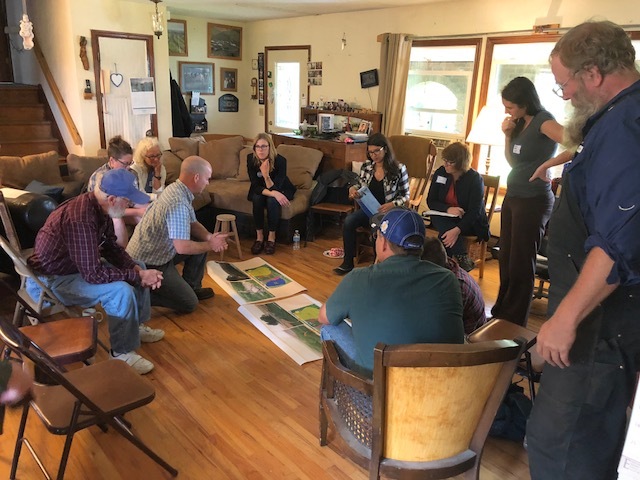 Land Stewardship Action in action — another great meeting! So, we encourage you to vote tomorrow, and also in November, to help elect the leaders who will work with us to make a positive difference in our state. In the meetings we’ve held and other conversations and events (like the April 29 forum in Willmar), what we have experienced and observed from Rep. Murphy is a sincere commitment to working alongside ordinary Minnesotans, in our communities and with our organizations, around the serious issues that we know best. We believe Erin Murphy is the candidate who as Governor will most effectively move the priorities of Land Stewardship Action, and encourage you to take that into account as you prepare to vote. In our experience, people know that real change is needed. They know that corporate power has gone too far, and that a corporate-controlled economy and politics does not mean good things for people or the land. They know that a healthy food system, widespread opportunity to farm, and health care for all are achievable, if we are committed and work for them. So vote tomorrow for whomever you believe will work with us to advance stewardship, justice, and a shared prosperity on the land and in our communities. We urge our readers in Minnesota who are able to vote in tomorrow's primary to do so. Photo: Via the LSAF's Facebook page, Erin Murphy getting around a rural landscape. Did pro-Swanson Alliance for Jobs committee mailer overstate Walz's congressional salary? Although we moved to South Dakota last September, the pro-Swanson Alliance for Jobs Committee sent us the independent expenditure mailer on the top of this post. We're not voting in the Minnesota primary as that would be quite naughty, especially since we voted in the South Dakota primary earlier this summer. One sentence caught our eye: "You shouldn't hire a football coach if he leaves the field at halftime and you shouldn't pay a congressman $175,000 to miss almost 60% of his votes. However, unless Walz has abandoned a long-term policy about his congressional pay, since the last official House report on disbursements (page 8 here) he hasn't been paid $175,000 this year for his congressional work. Or for any year he's served in Congress. In 2016, Walz reported $149,690 in wages from the House of Representatives and his wife reported $58,629 from Mankato Area Public Schools (Independent District 77), where she is employed as an assessment coordinator. Walz, who was elected in 2006, has forgone cost-of-living wage increases during his House tenure. According to an Oct. 31, 2017, letter to Walz from the House’s office of Members’ Services, those increases were deducted from his pay. “To date you have returned funds to U.S. Treasury reducing the national debt by the amount of $81,684.00.” The actual salary of House members today is $174,000 a year. Note that Walz didn't use the cheap trick of publicly declaring that he'd forego a raise, then quietly collect it in the coming years. Nope, he has continued to return all years COLAs to the U.S.Treasury. We've contacted the Walz campaign to see if the Southern Minnesota congressman has continued his policy on his own salary through 2018. Potential DFL voters have also started receiving mailings from a pro-Swanson independent group that makes the same case. 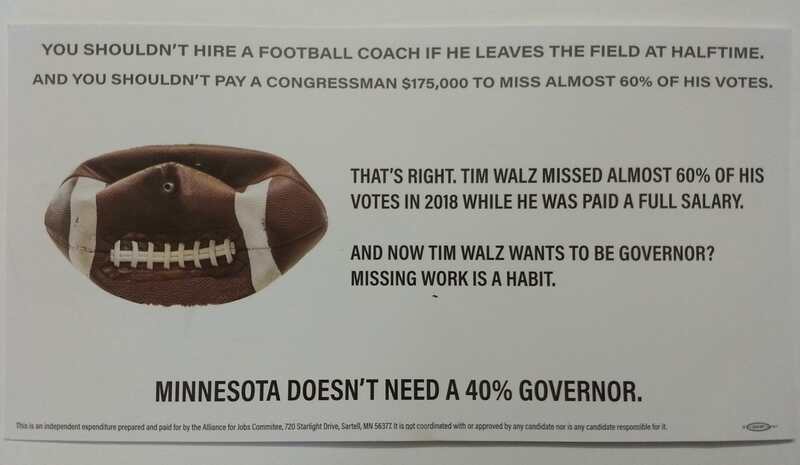 They use the same statistics and argue that Walz has a habit of missing work while still being paid by taxpayers. Swanson's campaign didn't make her available to comment Thursday, and she had no public events. She has been in a strong position in the race, given that she's widely known and has been elected statewide three times. The strategy to attack Walz could be a sign that dynamic has changed. The missed-votes message is one some Republicans were also testing out earlier this year, so it appears the Swanson team sees it as resonating with certain voters. At the Dakota County Fair where he was campaigning Thursday, Walz said it was disappointing that Swanson went on the attack. The attention suggests that momentum is on his side and his rival is trying to slow it, he added. Walz didn't dispute that he has missed votes in Congress this year, but he said he has been doing his job by providing input on a new federal farm bill and veteran affairs oversight. "No one has ever accused me of not being a hard worker. No one has ever accused me of not delivering," he said, adding that there's a risk involved with Swanson going negative. "The public is not in any mood for nonsense. They're in a mood for solutions; they're in a mood for seeing things get done. And trying to play one group off another or trying to wedge this issue probably doesn't work." Murphy, who has the DFL endorsement for governor, said she's not sure why Swanson launched the attack now but indicated that Walz's congressional attendance is fair game. "All of our records, our participation in the work that we're doing is subject for the voters to consider," she said. "I have shown up to do my job at the state Capitol and am showing up all over the state of Minnesota to earn the vote and the trust of the people of Minnesota." The attendance record is certainly fair game, but we can see why the Alliance for Jobs might not want to bring up Walz's real salary history. Who is the Alliance for Jobs? Alliance for Jobs carried $125,000 over from 2017 and has raised another $210,000 this year. It has sponsored at least two direct mail pieces supporting Lori Swanson-Rick Nolan gubernatorial ticket. In mailing, Swanson is portrayed as someone who will stand up to President Trump on issues such as the travel ban and the separation of families at the southern border. The big donors to Alliance for Jobs in 2018 are Vance Opperman, president and CEO of Key Investment (which, among other things, owns MSP Communications), who gave $75,000; John and Sue Morrison, who gave $25,000 this year (on top of the $25,000 they gave last year); and Dr. S.K. Dash, founder of biotech company UAS Labs, who gave $10,000 (plus $5,000 last year); and John Fruth, founder of Ocular Sciences, who gave $100,000 after the most-recent state report was filed. Fruth, Dash and the Morrisons have also each given the maximum-allowed $4,000 directly to the Swanson-Nolan campaign. Swanson’s campaigns — past and present — have traditionally spent little money on campaign staff. Despite spending more than $660,000 between her June 4 launch and July 23, her campaign did not pay a dollar in staff payroll. Campaign spokeswoman Ruth Stanoch told the Associated Press that Swanson’s campaign is staffed entirely by volunteers — old friends and allies who jumped at the chance to put her in the governor’s office. Instead, Swanson’s campaign has focused its spending on advertising, including a recent attack ad that highlighted Walz missing more than 60 percent of votes in Congress this year. Photo: One side of the mail piece attackiing Walz. While received this mail piece in Summit, this image is taken from a reddit discussion here.